Remember that document that is supposed to be the foundation of your business? Well, I also know that MANY BUSINESSES never actually got around to completing a business plan. You aren’t going to get very far targeting your audience and getting them into your sales funnel if you don’t know who you are trying to attract and what to do once you find them. And you won’t close any sales if you can’t rattle off 3 reasons why you are better than your competitor. Are you closing sales? Are you struggling? Do you have piles of business cards but no follow through? Do you need a change? Focusing on your fastest path to profits works! Your “fastest path to profits” allows you to build with less stress. Pick ONE service or product to start with. YES, ONE—because you’ll have to take it through all of the steps in this plan. It’s too complicated to try and pick multiple ideas. If you want this to be simple, you need to focus. You don’t have to do this FOREVER, and it will evolve over time…getting you closer and closer to your dream business. IT DOESN’T HAVE TO BE SO HARD…Zero in on your best service or product to generate income quickly. Once you start making a profit, you can reinvest this as needed to keep building. It may seem like the more things you offer for sale and the more markets that you try to target, the more money you will make. Doing more seems like it would give you more results. Think of every product or service that you have as a spinning plate on a stick. It takes a lot of work to get multiple plates to start to spin. Unless you constantly work to keep the plates going, they crash to the floor. If you’re feeling overwhelmed, perhaps this is the root of the issue. You may be putting in a lot of effort, but instead of moving you forward to your desired results, it’s effort running back and forth trying to keep multiple things going. You’re overwhelmed from spending a lot of time, money & energy and not making the profits you hope for. When you are in the first few stages of business growth and need to get to the point of steady income, just focus on ONE clear path to profits. Instead of spinning multiple plates, all of your effort goes towards reaching the magic number of units you need to sell per month to reach your income goals. As you expand your growth, you can add onto this. 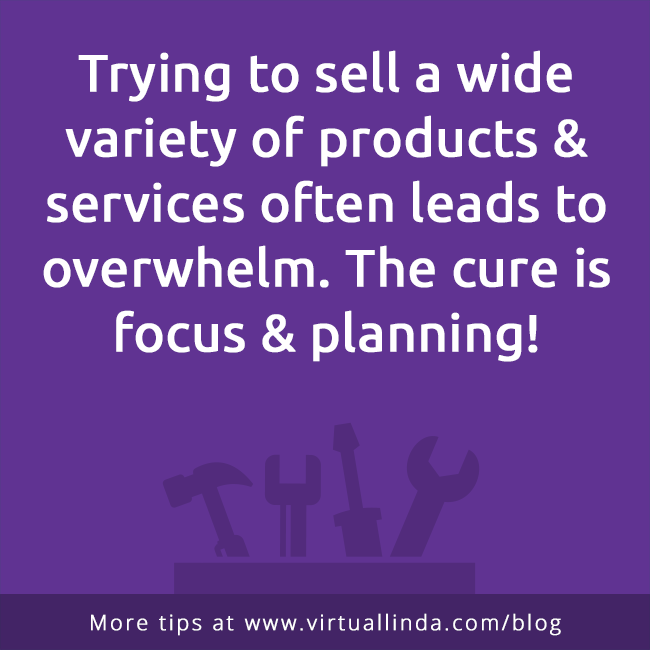 Often, service-based businesses can do this with upsells—selling additional products or services to their existing clients. This is much less effort than needing to acquire a brand new customer for every single sale! Your stress level and TO-DO list is dramatically reduced. You’ll know what to say YES to, bringing back your passion! You can develop a more comprehensive strategy later on by working 1-on-1 with me or another business coach. I can give you a jump-start on filling in the missing pieces. If you are playing catch up from past business mistakes, well, it will be a little bit painful at first. Many Entrepreneurs have so many great ideas that they don’t actually have an official plan; they just jump right in. By taking some time to outline how you want your business to grow, your energy will be more focused and more powerful. I use tools such as questionnaires, worksheets and ebooks to get you moving. I ask you the key questions to help “fill in the blanks”, and put all of your thoughts down on paper, to share with other team members and get help as needed. Trust me when I say that your work on this will pay off with increased profit from your products or services! How Many New Clients Can You Fit into Your Busy Schedule?